Banana is a simple fruit found almost all over the world and is used in many ways. It is a quite cheap fruit and full of energy. All parts of Banana tree are useful, whether it's bark, flowers or the fruit peel. Do you know, Banana is a super fruit,contains all three natural sugar, Sucrose, fructose and Glucose with lots of fiber which makes it a super food for athletes. There are many more nutrition facts are also there in this fruit,so would you like to know about them?Then go through the below post. The amount of nutrition a medium Banana contains is about 105 calories. A medium sized banana has 0.4 g of fat and no Monounsaturated fat and no cholesterol. Banana is rich in Potassium, Fiber, Magnesium and Vitamins. It also have Sodium, Carbohydrates, Protein, Iron and sugar. You can give mashed banana to your 6 month old infant. Banana is the best nutritious food for infants. You should eat Banana daily to get rid of Anemia. Banana is a good source of IRON, hence it helps in the production of hemoglobin. Banana is great for younger looking skin, it has Vitamin C and B6 which are good for the elasticity of the skin.Banana has Antioxidants and manganese that protect skin from premature aging. and it is 75% of water, hydrating your skin completely. Bananas are best for hydrating and repairing cracked heels. Banana pulp for 10 minutes on cracked heels could give you soft looking supple feet. Banana being packed with potassium is best for students as it enhances Brain power. Banana have higher Potassium, Magnesium and less salt which makes it the best food for people struggling with problem of Blood Pressure. Banana has tryptophan, a type of protein known to relax the mind and makes one feel happier. Banana is great for people who are suffering from depression. Bananas have antacid effect and protect from Stomach Ulcers as well. Having antacid effect, Bananas help relieve heart burns too. If you suffer from heartburn, try having a banana before popping a pill. Banana can lower your body temperature when you have a fever.So you may try a banana when you have a fever. Getting Muscle cramps when you workout, try adding Bananas in your diet and get rid ofMuscle cramps. Next time a bug/Insect bites you try rubbing the inside of Banana Skin. The swelling and irritation will go immediately. 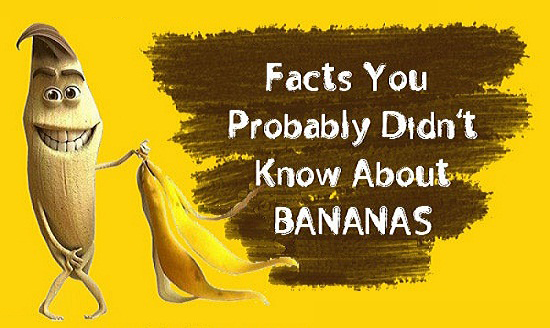 So have we forgot to write some other benefits of banana?Do let us inform through your comments. Good article on the health benefits of bananas. I eat those everyday but mainly to prevent muscle cramps because i'm always active. I didn't know you could use the peelings for insect bites. cool tips! Whoa I never knew potassium impacts the brain to the point of memory power. Would you know how many bananas is recommended to be eaten in a day? Banana is a fruit for all seasons and never have a day without it. More nutritional value coming from this fruit, and thank you for posting this article. Wow i never all this before, eat lot of bananas,that means i have benefited a lot. I eat banana because I need my regular dose of potassium when I run. You'll never look at a banana the same way again after discovering the many health benefits and reasons to add them to your diet. Bananas combat depression, make you smarter, cure hangovers, relieve morning sickness, protect against kidney cancer, diabetes, osteoporosis and blindness. I love bananas too. I even bring bananas at work for my snack. There are lots of benefits on eating bananas, thanks for sharing this. I will start to eat bananas now.